Next message: [BITList] ballsy brits? Maj. Eric Shontz, suited up for flight, is driven to a U-2 at Beale Air Force Base in California. The U-2 spy plane, the high-flying aircraft that was often at the heart of cold war suspense, is enjoying an encore. Senior Airman Alanna Cherry and Airman First Class Andres Morales monitoring imagery. Four years ago, the Pentagon was ready to start retiring the plane, which took its first test flight in 1955. But Congress blocked that, saying the plane was still useful. And so it is. Because of updates in the use of its powerful sensors, it has become the most sought-after spy craft in a very different war in Afghanistan. As it shifts from hunting for nuclear missiles to detecting roadside bombs, it is outshining even the unmanned drones in gathering a rich array of intelligence used to fight the Taliban. All this is a remarkable change from the U-2’s early days as a player in United States-Soviet espionage. Built to find Soviet missiles, it became famous when Francis Gary Powers was shot down in one while streaking across the Soviet Union in 1960, and again when another U-2 took the photographs that set off the Cuban missile crisis in 1962. Newer versions of the plane have gathered intelligence in every war since then and still monitor countries like North Korea. Now the U-2 and its pilots, once isolated in their spacesuits at 70,000 feet, are in direct radio contact with the troops in Afghanistan. And instead of following a rote path, they are now shifted frequently in midflight to scout roads for convoys and aid soldiers in firefights. In some ways, the U-2, which flew its first mission in 1956, is like an updated version of an Etch A Sketch in an era of high-tech computer games. One of those things, improbably enough, is that even from 13 miles up its sensors can detect small disturbances in the dirt, providing a new way to find makeshift mines that kill many soldiers. In the weeks leading up to the recent offensive in Marja, military officials said, several of the 32 remaining U-2s found nearly 150 possible mines in roads and helicopter landing areas, enabling the Marines to blow them up before approaching the town. Marine officers say they relied on photographs from the U-2’s old film cameras, which take panoramic images at such a high resolution they can see insurgent footpaths, while the U-2’s newer digital cameras beamed back frequent updates on 25 spots where the Marines thought they could be vulnerable. In addition, the U-2’s altitude, once a defense against antiaircraft missiles, enables it to scoop up signals from insurgent phone conversations that mountains would otherwise block. As a result, Colonel Brown said, the U-2 is often able to collect information that suggests where to send the Predator and Reaper drones, which take video and also fire missiles. He said the most reliable intelligence comes when the U-2s and the drones are all concentrated over the same area, as is increasingly the case. The U-2, a black jet with long, narrow wings to help it slip through the thin air, cuts an impressive figure as it rises rapidly into the sky. It flies at twice the height of a commercial jet, affording pilots views of such things as the earth’s curvature. But the plane, nicknamed the Dragon Lady, is difficult to fly, and missions are grueling and dangerous. The U-2s used in Afghanistan and Iraq commute each day from a base near the Persian Gulf, and the trip can last nine to 12 hours. Pilots eat meals squeezed through tubes and wear spacesuits because their blood would literally boil if they had to eject unprotected at such a high altitude. As the number of flights increases, some of the plane’s 60 pilots have suffered from the same disorienting illness, known as the bends, that afflicts deep-sea divers who ascend too quickly. Relaxing recently in their clubhouse at Beale Air Force Base near Sacramento, Calif., the U-2’s home base, several pilots said the most common problems are sharp joint pain or a temporary fogginess. But in 2006, a U-2 pilot almost crashed after drifting in and out of consciousness during a flight over Afghanistan. The pilot, Kevin Henry, now a retired Air Force lieutenant colonel, said in an interview that he felt as if he were drunk, and he suffered some brain damage. At one point, he said, he came within five feet of smashing into the ground before miraculously finding a runway. 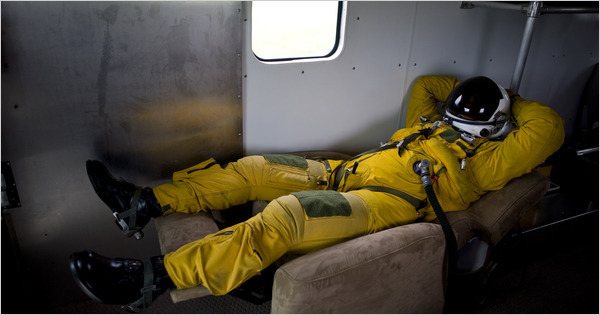 As a safety measure, U-2 pilots start breathing pure oxygen an hour before takeoff to reduce the nitrogen in their bodies and cut the risk of decompression sickness. Mr. Henry, who now instructs pilots on safety, thinks problems with his helmet seal kept him from breathing enough pure oxygen before his flight. Lt. Col. Kelly N. West, the chief of aerospace medicine at Beale, said one other pilot had also been disqualified from flying the U-2. Since 2002, six pilots have transferred out on their own after suffering decompression illnesses. Still, most of the pilots remain undeterred, and the Air Force is taking more precautions. Holding an oxygen mask to his nose, one pilot, Maj. Eric M. Shontz, hopped on an elliptical machine for 10 minutes before a practice flight at Beale to help dispel the nitrogen faster. Several assistants then made sure he stayed connected to an oxygen machine as they sealed his spacesuit and drove him to the plane. Major Shontz and other U-2 pilots say the planes gradually became more integrated in the operations in Iraq and Afghanistan. But since the flights over Afghanistan began to surge in early 2009, the U-2s have become a much more fluid part of the daily battle plan. Major Shontz said he was on the radio late last year with an officer as a rocket-propelled grenade exploded. “You could hear his voice talking faster and faster, and he’s telling me that he needs air support,” Major Shontz recalled. He said that a minute after he relayed the message, an A-10 gunship was sent to help. Brig. Gen. H.D. Polumbo Jr., a top policy official with the Air Force, said recent decisions to give intelligence analysts more flexibility in figuring out how to use the U-2 each day had added to its revival. Over beers at the clubhouse, decorated with scrolls honoring the heroes of their small fraternity, other U-2 pilots say they know their aircraft’s reprieve will last only so long. And the U-2’s replacement sits right across the base — the Global Hawk, a remote-controlled drone that flies almost as high as the U-2 and typically stays aloft for 24 hours or more. The first few Global Hawks have been taking intelligence photos in Iraq and Afghanistan. But a larger model that could also intercept communications has been delayed, and the Air Force is studying how to add sensors that can detect roadside bombs to other planes. So officials say it will most likely be 2013 at the earliest before the U-2 is phased into retirement.